I hereby agree to the storage and publishing on Soyuz Alliance sites of my personal data to the extent of my forename and surname, VATSIM id, IVAO vid, and statistics of my flights in Soyuz Alliance. E-mail address could be used exclusively by site administration to contact me. I agreed to get email notifications related to functioning of virtual airlines, but have ability to unsubsribe from them any time. I am able to cancel my membership in Soyuz Alliance anytime and ask administration to remove my name and e-mail frome database forever. 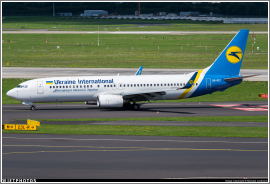 Welcome to Virtual Airlines of Ukraine. We are a non-commercial group of flight simulation enthusiasts. We are not a real world airline, nor are we affiliated or endorsed by any airline. If you were looking for the real Ukrainian Airlines, leave this page, please.